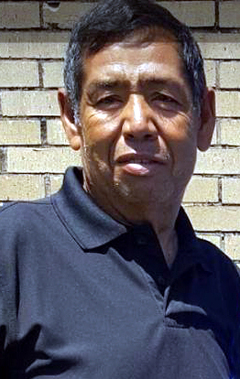 Albert Reyna Sr., 66, passed away Wednesday, September 26, 2018 in Lubbock. Services will be 9:30 a.m. Saturday, September 29, 2018 at Calvillo Funeral Home Chapel with Father Martin Pina officiating. Burial will follow in Lorenzo Cemetery under the direction of Calvillo Funeral Home. A rosary will be held 7:00 p.m., Friday, September 28, 2018 at Calvillo Funeral Home Chapel. Albert was born August 12, 1952 in Floydada to the late Antonio & Elvira Reyna. He worked as a front end loader for South Plains Compost for a number of years. An avid Dallas Cowboys fan, Albert loved cheering his team onto victory, loved raising animals and had a spirit for traveling. His most joyful memories were spent with his family. He is preceded in death by his parents; a son Albert Reyna Jr.; A daughter Carolina Reyna. He is survived by two daughters Norma Hernandez of Lubbock and Dorothy Luna of Houston; brothers Jimmy Reyna of Ralls and Johnny Reyna of Robertson; sisters Virginia Delgado of Ralls and Elvira Mendoza of Lorenzo; A girlfriend Elvira Villegas of Lubbock; step sons John Villegas and Alfredo Villegas both of Lubbock; thirteen grandchildren, three great grandchildren and seven step grandchildren.